I wore this outfit to my sweet nephew's 3rd birthday party (where has the time gone!?) this past weekend. He had a train birthday party (hence the corny pose on the train tracks) at the Oklahoma Railway Museum. The place is pretty cool, even if you aren't a 3 year old boy. You can climb inside actual trains and they have a huge model train area. At one point, there was a girl (lady? woman? 20-something?) in a ball gown having her pictures taken by a photographer. I walked by, smiled coyly and thought "I will be doing that later..." but my pictures were taken in a 5 minute span that included Eric pursing his lips because he did not want to be doing this right now and I'm whispering hurry! someone's coming! Gah, the things I do for this blog. OK the title of this post alone had me cracking up at it's straightforwardness. But then your last comment sent me over the edge. "Hurry someone's coming!" is something I've said on more than one occasion. Or it's the try-to-pretend-I-was-just -taking-one-picture-not-20 act and trying to look nonchalant. LOLOLOLOLOLOLOLOL. I can so relate to this post. That shirt/scarf combination is so beautiful! I know this is totally creepy, but you were in my dream last night. I was telling you about the merits of a tumblr that satirizes racism. I debated telling you this because I KNOW how creepy it is, but I couldn't stop myself because it was so weird and random. This is so pretty and bright. I absolutely love the train tracks for the background. I can only imagine how pretty dress pictures were in this setting. Good for you for Eric to even take the pictures. Corey won't even touch the camera. Well the photos still turned out great even if they were taken under duress. ;) And I love the color of that shirt on you! I have to confess that for one second I thought this said "Train Wreck" and I was very intrigued. But this is not a train wreck at all! You are looking very vibrant! I love that you hopped outside a party to take these pics AND that someone else had already beaten you to it! I have definitely had one of these moments when I made Hunter take pics for me. Oh well, we're a shameless bunch, aren't we? Hurry, someones coming! I love it! If I take pictures when we are in public, I make one of the kids get in them so I feel less dorky. You are looking beautiful. Can relate! My favorite is when someone is coming and I tell my husband/son/daugther to stop and then we have a fake conversation while the person passes. Not that my husband/son/daughter is holding a camera and I may not be wearing a jacket or coat. I do like your setting and that pretty pink color on you. haha I want to know what the ballgown lady was up to.. lol. Love the sweater! I'm a massive fan of colour so I just had to click on your link. Love the boldness of the pink! You look great. Ahaha but it was all worth it because these are pretty great pictures! I've been noticing your adventures through your blog photos lately! Love this outfit too, that bright blouse is so fun with the zippered cardigan. 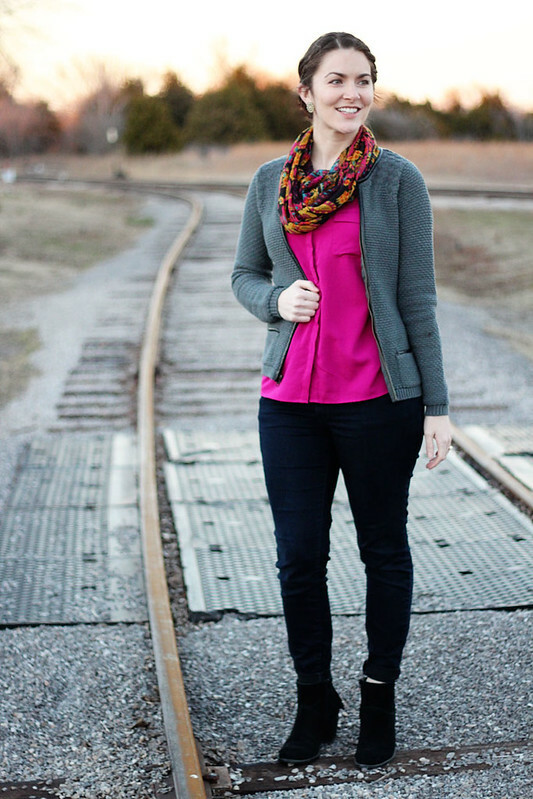 You really aren't a real fashion blogger until you have train track photos. The lighting is beautiful so it was a good thing you waited! I don't know if my husband would actually take photos for me in a place other than our driveway. 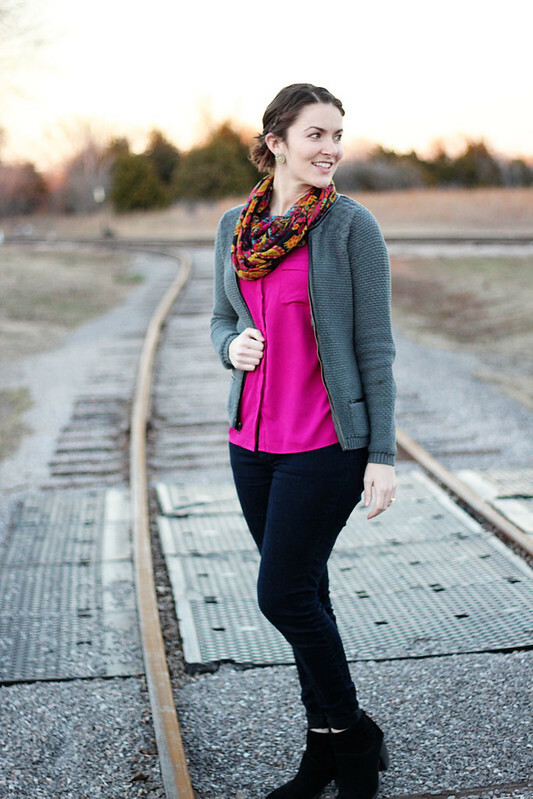 Love your cardigan and pretty pink top! Your photos turned out great! 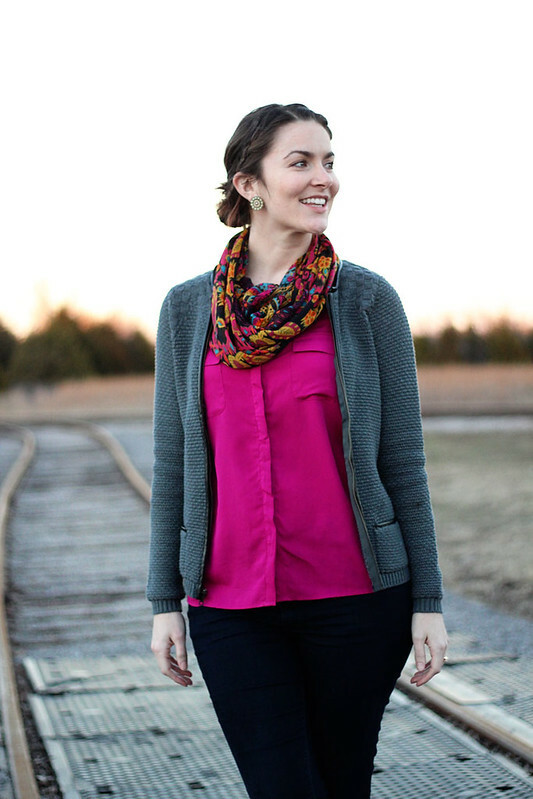 I love the bold colors of your top and scarf! Haha that sounds like me when I'm taking blog pictures somewhere other than outside my house (which happens practically never these days)! Love the pictures though, and I really love this look! The pink really pops. Haha. In love with that blazer-cardigan. Pretty earrings too. I just recently wore pink with gray. it is a great duo. Enjoy the weekend with your sweet baby boy. Haha that's what I think whenever I take pictures outside, even if they're just in my backyard :) I really like the train tracks as a background and this is such a great outfit and a gorgeous color of your top! Love love love love this color combination! You killed it girl! Haha! I feel the same about taking pics in public! Love this outfit!! haha I know that frustrated photographer's speech all too well! that's why I borrowed a tripod and got a remote for my camera, so i could avoid the grumbles as I snapped a pic or two hehe!